Panduit FCXO-12-10Y Optimized OM3 10Gig 50/125um 6 LC duplex adapters to one male 12-fiber pre-terminated MTP connector. Panduit FCXO-24-10Y Optimized OM3 10Gig 50/125um 12 LC duplex adapters to two male 12-fiber pre-terminated MTP connectors. Panduit FCXO-12-3Y Optimized OM3 10Gig 50/125um 6 SC duplex adapters to one male 12-fiber pre-terminated MTP connector. Panduit FCZ-12-10Y OM4 10Gig QuickNet 6 LC duplex adapters to one male MTP connector. Method A.
Panduit FCZ-24-10Y OM4 10Gig QuickNet 12 LC duplex adapters to two male MTP connectors. Method A.
Panduit FCZ-12-3Y OM4 10Gig QuickNet 6 SC duplex adapters to one male MTP connector. Method A.
Panduit FC6-12-10Y OM1 62.5/125um six LC duplex adapters to one male 12-fiber pre-terminated MTP connector. Panduit FC6-24-10Y OM1 62.5/125um twelve LC duplex adapters to two male 12-fiber pre-terminated MTP connectors. Panduit FC6-12-3SY OM1 62.5/125um six SC simplex adapters to one male 12-fiber pre-terminated MTP connector. Panduit FC6-12-3Y OM1 62.5/125um six SC duplex adapters to one male 12-fiber pre-terminated MTP connector. 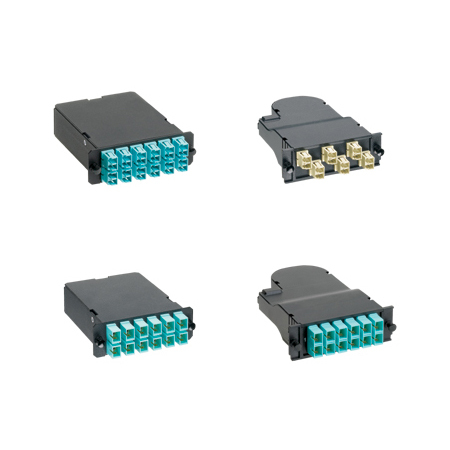 Panduit FC9-12-10Y OS1/OS2 Singlemode six LC duplex adapters to one male 12-fiber pre-terminated MTP connector. Panduit FC9-24-10Y OS1/OS2 Singlemode twelve LC duplex adapters to two male 12-fiber pre-terminated MTP connectors. Panduit FC9-12-3SY OS1/OS2 Singlemode six SC simplex adapters to one male 12-fiber pre-terminated MTP connector. Panduit FC9-12-3Y OS1/OS2 Singlemode six SC duplex adapters to one male 12-fiber pre-terminated MTP connector.